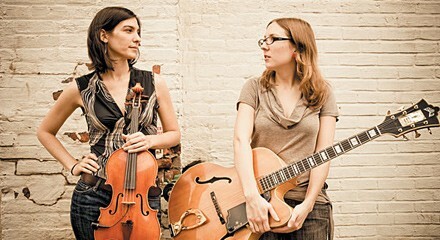 Guitarist Mary Halvorson is duly celebrated for her excellent trio and quintet projects, to say nothing of her valuable work in bands led by the likes of Tom Rainey, Ingrid Laubrock, and Ches Smith; violist Jessica Pavone has become a terrific long-form composer, and last year she released the song cycle Hope Dawson Is Missing (Tzadik). But as much as their long-running duo together has been overshadowed lately, I retain a great fondness for it. It’s always felt relaxed and low-key, like a couple of pals singing songs for kicks—their rigorous improvisations and technical displays are couched in folksy compositions that sometimes include unpolished vocals. They released their fourth and best album, Departure of Reason (Thirsty Ear), a couple years ago, and though it’s got the same easygoing rapport and sense of fun, otherwise Halvorson and Pavone seriously step up their game. The compositions, split equally between them, are stronger than anything they’ve ever done, with more dynamic arrangements, more structured interplay, more sophisticated melodies, and a more forceful, confident feel. The rhythmically strummed guitar, strident viola double-stops, and spooky unison vocals on “The Object of Tuesday” give it a loose, woozy, rustic flavor, and the aggressive give-and-take on the seesawing instrumental “That Other Thing” is an exhilarating example of what distinguishes the new album from its predecessors. This is the duo’s first Chicago date in almost four years; it’s part of the opening-night concert of the first Chicago Jazz String Summit, organized by cellist Tomeka Reid and violinist James Sanders. —Peter Margasak Musique Noire headlines; Jessica Pavone & Mary Halvorson, the Tomeka Reid Trio, James Sanders’s Blue Violin Quartet open.